The Sweet Track is an ancient causeway in the Somerset Levels, England. It was built in either 3807 or 3806 BC and was the oldest timber trackway discovered in Northern Europe until the 2009 discovery of a 6,000-year-old trackway in Plumstead, London. It is now known that the Sweet Track was predominantly built over the course of an earlier structure, the Post Track. The track extended across the now largely drained marsh between what was then an island at Westhay and a ridge of high ground at Shapwick, a distance close to 2,000 metres (6,600 ft). The track is one of a network that once crossed the Somerset Levels. Various artefacts, including a jadeitite ceremonial axe head, have been found along its length. Construction was of crossed wooden poles, driven into the waterlogged soil to support a walkway that consisted mainly of planks of oak, laid end-to-end. The track was used for a period of only around 10 years and was then abandoned, probably due to rising water levels. 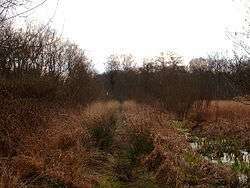 Following its discovery in 1970, most of the track has been left in its original location, with active conservation measures taken, including a water pumping and distribution system to maintain the wood in its damp condition. Some of the track is stored at the British Museum and a reconstruction of a section was built at the Peat Moors Centre near Glastonbury. In the early 4th millennium BC the track was built between an island at Westhay, and a ridge of high ground at Shapwick close to the River Brue. A group of mounds at Westhay mark the site of pre-historic lake dwellings, which were likely to have been similar to those found in the iron age Glastonbury Lake Village near Godney, itself built on a morass on an artificial foundation of timber filled with brushwood, bracken, rubble and clay. The remains of similar tracks have been uncovered nearby, connecting settlements on the peat bog; they include the Honeygore, Abbotts Way, Bells, Bakers, Westhay, and Nidons trackways. Sites such as the nearby Meare Pool provide evidence that the purpose of these structures was to enable easier travel between the settlements. Investigation of the Meare Pool indicates that it was formed by the encroachment of raised peat bogs around it, particularly during the Subatlantic climatic period (1st millennium BC), and core sampling demonstrates that it is filled with at least 2 metres (6.6 ft) of detritus mud. The two Meare Lake Villages within Meare Pool appear to originate from a collection of structures erected on the surface of the dried peat, such as tents, windbreaks and animal folds. Clay was later spread over the peat, providing raised stands for occupation, industry and movement, and in some areas thicker clay spreads accommodated hearths built of clay or stone. The track was discovered in 1970 during peat excavations, and is named after its finder, Ray Sweet. The company he worked for, E. J. Godwin, sent part of a plank from the track to John Coles, an assistant lecturer in archaeology at Cambridge University, who had carried out some excavations on nearby trackways. Coles' interest in the trackways led to the Somerset Levels Project, which ran from 1973 to 1989, funded by various donors including English Heritage. The project undertook a range of local archaeological activities, and established the economic and geographic significance of various trackways from the 3rd and 1st millennium BC. The work of John Coles, Bryony Coles and the Somerset Levels Project was recognised in 1996 when they won the Imperial Chemical Industries (ICI) Award for the best archaeological project offering a major contribution to knowledge, and in 2006 with the European Archaeological Heritage Prize. Dendrochronology (tree-ring dating) of the timbers has enabled precise dating of the track, showing it was built in 3807 or 3806 BC. This dating led to claims that the Sweet Track was the oldest roadway in the world, until the discovery in 2009 of a 6,000 year-old trackway in Plumstead, near Belmarsh prison. Analysis of the Sweet Track's timbers has aided research into Neolithic Era dendrochronology; comparisons with wood from the River Trent and a submerged forest at Stolford enabled a fuller mapping of the rings, and their relationship with the climate of the period. The wood used to build the track is now classed as bog-wood, the name given to wood (of any source) that for long periods (sometimes hundreds of thousands of years) has been buried in peat bogs, and kept from decaying by the acidic and anaerobic bog conditions. Bog-wood is usually stained brown by tannins dissolved in the acidic water, and represents an early stage of fossilisation. The age of the track prompted large-scale excavations in 1973, funded by the Department of the Environment. In 1973 a jadeitite axehead was found alongside the track; it is thought to have been placed there as an offering. One of over 100 similar axe heads found in Britain and Ireland, its good condition and its precious material suggest that it was a symbolic axe, rather than one used to cut wood. Because of the difficulty of working this material, which was derived from the Alpine area of Europe, all the axe heads of this type found in Great Britain are thought to have been non-utilitarian and to have represented some form of currency or be the products of gift exchange. Radiocarbon dating of the peat in which the axe head was discovered suggests that it was deposited in about 3200 BC. Wooden artefacts found at the site include paddles, a dish, arrow shafts, parts of four hazel bows, a throwing axe, yew pins, digging sticks, a mattock, a comb, toggles and a spoon fragment. Finds made from other materials, such as flint flakes, arrowheads and a chipped flint axe (in mint condition) have also been made. A geophysical survey of the area in 2008 showed unclear magnetometer data; the wood may be influencing the peat's hydrology, causing the loss or collection of minerals within the pore water and peat matrix. The community that constructed the trackway were Neolithic farmers who had colonised the area around 3900 BC and the evidence suggests that they were, by the time of construction, well organised and settled. Before this human incursion the uplands surrounding the levels were heavily wooded, but local inhabitants began to clear these forests about this time to make way for an economy that was predominately pastoral with small amounts of cultivation. During the winter the flooded areas of the levels would have provided this fishing, hunting, foraging and farming community with abundant fish and wildfowl; in the summer, the drier areas provided rich, open grassland for grazing cattle and sheep, reeds, wood and timber for construction, and abundant wild animals, birds, fruit and seeds. The need to reach the islands in the bog was sufficiently pressing for them to mount the enormous communal activity required for the task of stockpiling the timber and building the trackway, presumably when the waters were at their lowest after a dry period. The work required for the construction of the track demonstrates that they had advanced woodworking skills and suggests some differentiation of occupation among the workers. They also appear to have been managing the surrounding woodland for at least 120 years. Built in 3807 or 3806 BC, the track was a walkway consisting mainly of planks of oak laid end-to-end, supported by crossed pegs of ash, oak and lime, driven into the underlying peat. The planks, which were up to 40 centimetres (16 in) wide, 3 metres (120 in) long and less than 5 centimetres (2.0 in) thick, were cut from trees up to 400 years old and 1 metre (39 in) in diameter, felled and split using only stone axes, wooden wedges and mallets. The length, straightness, and lack of forks or branches in the pegs suggest that they were taken from coppiced woodland. 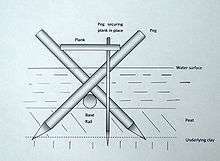 Longitudinal log rails up to 6.1 metres (20 ft) long and 7.6 centimetres (3.0 in) in diameter, made of mostly hazel and alder, were laid down and held in place with the pegs, which were driven at an angle across the rails and into the peat base of the bog. Notches were then cut into the planks to fit the pegs, and the planks were laid along the X shapes to form the walkway. In some places a second rail was placed on top of the first one to bring the plank above it level with the rest of the walkway. Some of the planks were then stabilised with slender, vertical wooden pegs driven through holes cut near the end of the planks and into the peat, and sometimes the clay, beneath. At the southern end of the construction smaller trees were used, and the planks split across the grain to utilise the full diameter of the trunk. Fragments of other tree species including holly, willow, poplar, dogwood, ivy, birch, and apple have also been found. The wetland setting indicates that the track components must have arrived prefabricated, before being assembled on site, although the presence of wood chips and chopped branches indicates that some trimming was performed locally. The track was constructed from about 200,000 kilograms (440,000 lb) of timber, but Coles estimates that once the materials were transported to the site, ten men could have assembled it in one day. The Sweet Track was used only for about ten years; rising water levels may have engulfed it, and therefore curtailed its use. The variety of objects found alongside the track suggest that it was in daily use as part of the farming life of the community. Since its discovery, it has been determined that parts of the Sweet Track were built along the route of an even earlier track, the Post Track, which was constructed thirty years earlier in 3838 BC. Most of the track remains in its original location, which is now within the Shapwick Heath biological Site of Special Scientific Interest and National Nature Reserve. Following purchase of land by the National Heritage Memorial Fund, and installation of a water pumping and distribution system along a 500-metre (1,600 ft) section, several hundred metres of the track's length are now being actively conserved. This method of preserving wetland archaeological remains (i.e. maintaining a high water table and saturating the site) is rare. A 500-metre (1,600 ft) section, which lies within the land owned by the Nature Conservancy Council, has been surrounded by a clay bank to prevent drainage into surrounding lower peat fields, and water levels are regularly monitored. The viability of this method is demonstrated by comparing it with the nearby Abbot's Way, which has not had similar treatment, and which in 1996 was found to have become dewatered and desiccated. 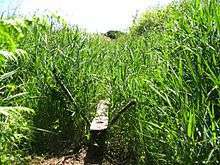 Evaluation and maintenance of water levels in the Shapwick Heath Nature Reserve involves the Nature Conservancy Council, the Department for Environment, Food and Rural Affairs, and the Somerset Levels Project. Although the wood recovered from the Levels was visually intact, it was extremely degraded and very soft. Where possible, pieces of wood in good condition, or the worked ends of pegs, were taken away and conserved for later analysis. The conservation process involved keeping the wood in heated tanks in a solution of polyethylene glycol and, by a process of evaporation, gradually replacing the water in the wood with the wax over a period of about nine months. After this treatment the wood was removed from the tank and wiped clean. As the wax cooled and hardened the artifact became firm and could be handled freely. A section of the track on land owned by Fisons (who extracted peat from the area) was donated to the British Museum in London. Although this short section can be assembled for display purposes, it is currently kept in store, off site, and under controlled conditions. A reconstructed section was displayed at the Peat Moors Centre near Glastonbury. The centre was run by the Somerset Historic Environment Service, but was closed in October 2009 as a result of budget cuts imposed by Somerset County Council. The main exhibits are extant, but future public access is uncertain. Other samples of the track are held in the Museum of Somerset. Sections of the track have been designated as a Scheduled Monument, meaning that it is a "nationally important" historic structure and archaeological site protected against unauthorised change. These sections are also included in English Heritage's Heritage at Risk Register. 1 2 3 4 5 6 "Sweet Track, Shapwick Heath". Somerset Historic Environment Record. South West Heritage Trust. Retrieved 29 September 2016. ↑ Cunliffe, Barry (2005). Iron Age Communities in Britain (4th Ed). Abingdon, Oxon: Routledge. p. 266. ISBN 0-415-34779-3. 1 2 "Sweet Track – Somerset Levels". Digital Digging. Archived from the original on 5 March 2012. Retrieved 8 June 2010. ↑ Rippon, Stephen (2004). "Making the Most of a Bad Situation? Glastonbury Abbey, Meare, and the Medieval Exploitation of Wetland Resources in the Somerset Levels" (PDF). Medieval Archaeology. Maney Publishing. 48: 119. doi:10.1179/007660904225022816. ↑ Godwin, H.; Macfadyen, W. A. (1955). "Studies of the Post-Glacial History of British Vegetation. XIII. The Meare Pool Region of the Somerset Levels". Philosophical Transactions of the Royal Society B. Royal Society. 239 (662): 161–190. Bibcode:1955RSPTB.239..161G. doi:10.1098/rstb.1955.0008. ↑ Chapmana, Henry P.; Van de Noort, Robert (2001). "High-Resolution Wetland Prospection, using GPS and GIS: Landscape Studies at Sutton Common (South Yorkshire), and Meare Village East (Somerset)". Journal of Archaeological Science. 28 (4): 365–375. doi:10.1006/jasc.2000.0581. Retrieved 11 July 2010. 1 2 Brunning, Richard (2000). "11. Neolithic and bronze-age Somerset: a wetland perspective". In CJ Webster. Somerset Archaeology: Papers to Mark 150 Years of the Somerset Archaeological and Natural History Society (PDF). South West Heritage Trust. ↑ Coles, J.M. (1978). "Man and landscape in the Somerset Levels". In Susan Limbrey. Effect of Man on the Landscape: The Lowland Zone (PDF). York: Council for British Archaeology. pp. 86–89. ISBN 978-0-900312-60-1. ↑ "British Archaeological Awards". Council for British Archeology. Archived from the original on 3 June 2008. Retrieved 17 June 2010. ↑ "European Archaeological Heritage Prize 2006" (PDF). European Association of Archaeologists. Retrieved 17 June 2010. ↑ "Highlights". Current Archaeology. Current Archaeology. XV (4) (172 (Special issue on Wetlands)). February 2001. ↑ Lay, M. G.; Vance, James E. (1999). Ways of the World: A History of the World's Roads and of the Vehicles that Used Them. Rutgers University Press. p. 51. ISBN 978-0-8135-2691-1. ↑ Hillam, J.; Groves, C. M.; Brown, D. M.; Baillie, M. G. L.; Coles, J. M.; Coles, B. J. (1990). "Dendrochronology of the English Neolithic" (PDF). Antiquity. 64 (243). ↑ Hunter, John; Rolston, Ian (1999). The Archaeology of Britain: An Introduction from Earliest Times to the Twenty-First Century: An Introduction from the Upper Palaeolithic to the Industrial Revolution. London: Routledge. pp. 63–64. ISBN 978-0-415-13588-7. ↑ "Jadeite axe-head". British Museum. Archived from the original on 21 February 2009. Retrieved 21 November 2009. ↑ Barker, Graeme (1999). Companion encyclopedia of archaeology. New York: Routledge. p. 378. ISBN 0-415-21329-0. ↑ Smith, I.F. (1978). "The chronology of British stone implements". In T H McK Clough and W A Cummins. Stone axe studies: archaeological, petrological, experimental and ethnographic (PDF). York: Council for British Archaeology. pp. 13–22. ISBN 0-900312-63-7. Retrieved 14 July 2010. ↑ "Neolithic finds, Shapwick Heath, Shapwick". Somerset Historic Environment Record. South West Heritage Trust. Retrieved 29 September 2016. ↑ Armstrong, K.; Cheetham, P (2008). "Archaeological geophysical prospection in peatland environments: Locating the Sweet Track at Canada Farm, Shapwick Heath (Somerset)" (PDF). EIGG 8th Meeting on Recent Work In Archaeological Geophysics, 16 Dec 2008, The Geological Society, Burlington House, London, UK. Bournemouth University. Retrieved 8 June 2010. 1 2 3 4 5 Costen, M. D. (1992). The origins of Somerset. Manchester: Manchester University Press. pp. 4, 5. ISBN 0-7190-3675-5. ↑ Scarry, C. Margaret (1993). Foraging and farming in the eastern woodlands. Gainesville: University Press of Florida. pp. 118, 119. ISBN 0-8130-1235-X. ↑ Aston, Michael (1997). Interpreting the landscape: landscape archaeology and local history. New York: Routledge. p. 26. ISBN 0-415-15140-6. ↑ Brunning, Richard (February 2001). 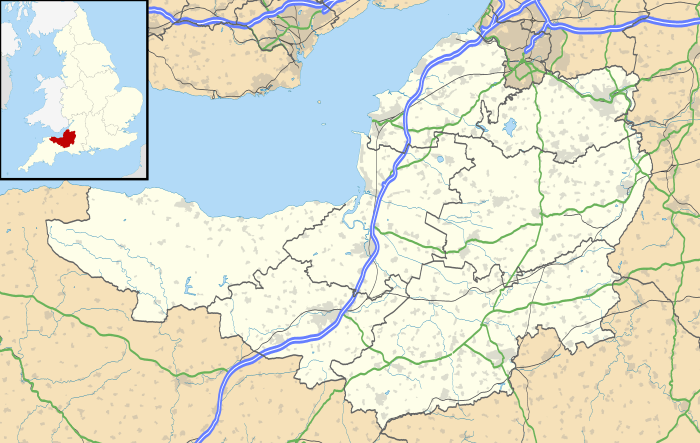 "The Somerset Levels". Current Archaeology. Current Archaeology. XV (4) (172 (Special issue on Wetlands)): 139–143. 1 2 3 4 "1986,1201.1–27 Sweet Track exhibition highlight". British Museum. Archived from the original on 29 April 2011. Retrieved 19 June 2010. 1 2 Coles, Bryony (15 October 1987). "Archaeology follows a wet track". New Scientist. IPC magazines (1582): 46. ↑ Otter, R. A. (1994). Civil Engineering Heritage: Southern England. London: Thomas Telford ltd. p. 101. ISBN 978-0-7277-1971-3. ↑ Fleming, Neil; Grant, Jim; Gorin, Sam (2008). The archaeology coursebook: an introduction to themes, sites, methods and skills. New York: Routledge. p. 277. ISBN 0-415-46286-X. ↑ Daniel, Glyn (9 October 1986). "World's oldest road". New Scientist. IPC magazines Ltd. 261 (2529): 100. Bibcode:1989SciAm.261e.100C. doi:10.1038/scientificamerican1189-100. ↑ Rahtz, Phillip; Watts, Lorna (2003). Glastonbury Myth and archaelogy. Stroud: Tempus. p. 25. ISBN 978-0752425481. ↑ "Wood Culture: Programme7-08" (PDF). Centre for Contemporary Art and the Natural World. p. 2. Retrieved 8 June 2010. ↑ Hill-Cottingham, Pat; Briggs, D.; Brunning, R.; King, A.; Rix, G (2006). The Somerset Wetlands. Somerset Books. ISBN 0-86183-432-1. ↑ "Post Track, Shapwick Heath". Somerset Historic Environment Record. South West JHeritage Trust. Retrieved 29 September 2016. ↑ "Shapwick Heath NNR". Natural England. Retrieved 31 January 2010. ↑ "4.20.4 The Sweet Track, the Brue Valley, Somerset: assessment of in situ preservation". Archeology Review. 1996–1997. Archived from the original on 29 May 2010. Retrieved 7 June 2010. ↑ Van de Noort, Robert; Chapman, Henry; Cheetham, James. "Science-based conservation and management in wetland archaeology: the example of Sutton Common, UK". In B. Purdy. Enduring Records. The Environmental and Cultural Heritage of Wetlands. Oxford: Oxbow Books. pp. 277–286. ISBN 1-84217-048-1. ↑ Purdy, Barbara A. (1990). Wet site archaeology. Boca Raton, FL: CRC Press. p. 99. ISBN 978-0-936923-08-6. ↑ Cox, Margaret; Earwood, Caroline; Jones, E.B. Gareth; Jones, Julie; Straker, Vanessa; Robinson, Mark; Tibbett, Mark; West, Steven (October 2001). "An Assessment of the Impact of Trees upon Archaeology Within a Relict Wetland". Journal of Archaeological Science. 28 (10): 1069–1084. doi:10.1006/jasc.2000.0642. Retrieved 8 June 2010. ↑ "Scheduled monuments policy statement". Gov.uk. Retrieved 21 November 2015. ↑ "South West England" (PDF). Heritage at Risk. English Heritage. p. 183. Retrieved 30 June 2010. Coles, John; Coles, Bryony (1986). Sweet Track to Glastonbury: the Somerset Levels in prehistory. London: Thames and Hudson. ISBN 0-500-39022-3. Coles, Bryony; Coles, John (1980). Prehistory of the Somerset levels. Cambridge: Somerset Levels Project. ISBN 0-9507122-0-5.